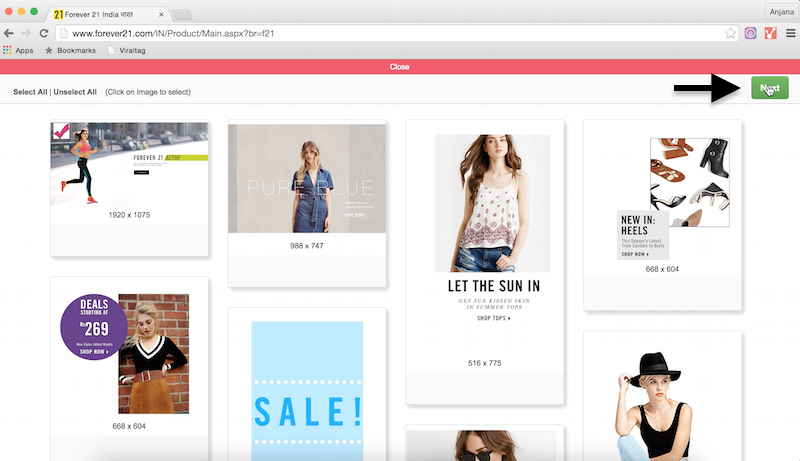 Our Viraltag chrome extension & bookmarklet allows you to schedule images from any website with a simple click. 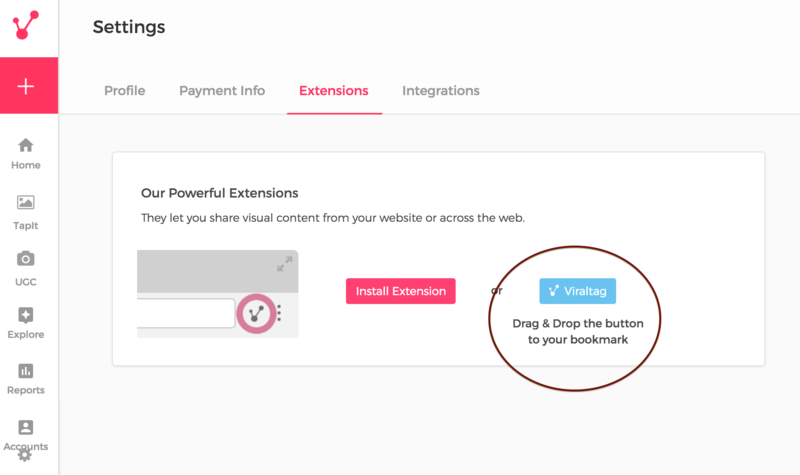 To get started, you first need to install the button from the Viraltag website. 4. 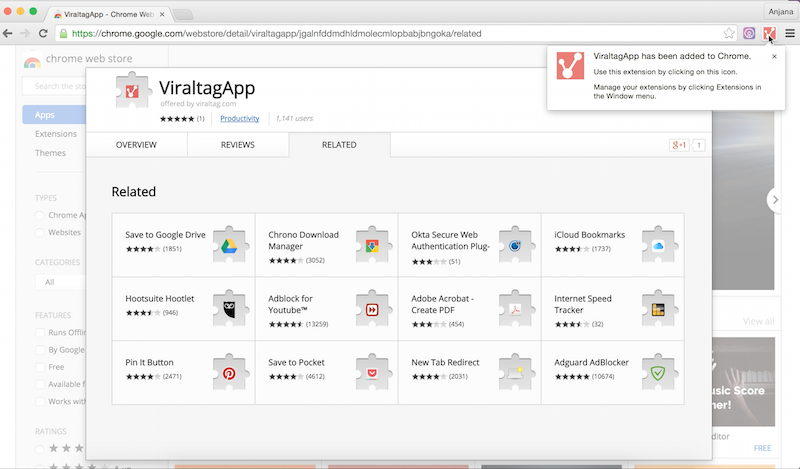 You will be redirected to the Chrome app store where the Viraltag app will open automatically. Click on the "Add to Chrome" button on the top right hand corner of the window. 5. 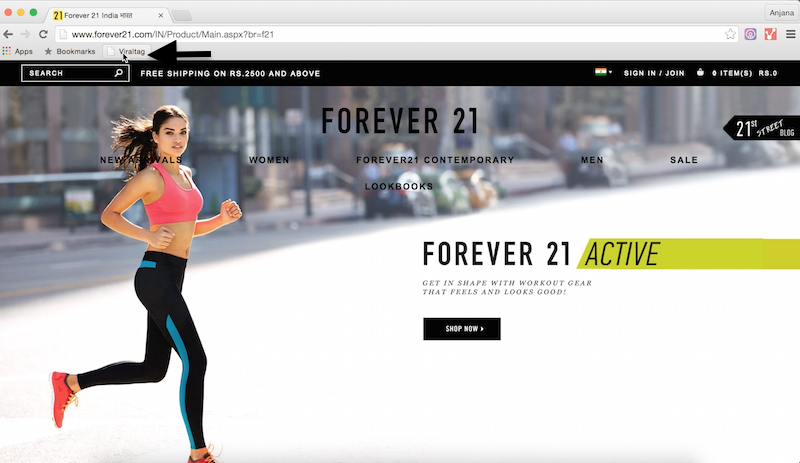 You will see a pop up asking for permission to add the Viraltag Chrome Extension. To proceed, click on "Add extension". 6. 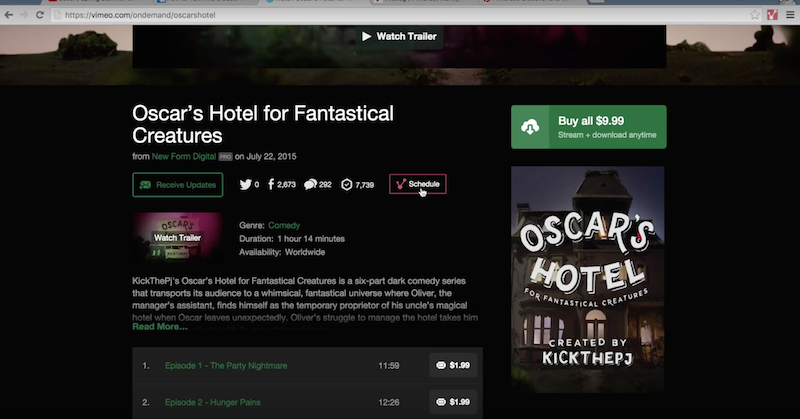 Your Viraltag Toolbar Button has been installed and you can see it in your toolbar. 1. Step 1 and 2 is the same as what has been explained under Installing the Extension. 2. Then click on the blue 'Viraltag' Bookmarklet, hold it and drag it to your bookmarks toolbar. 3. You can now use the Bookmarklet button from your toolbar to schedule images from anywhere in the web, except for Pinterest. You can schedule images from anywhere in the web using your toolbar button once it's installed. You can view the video demo or refer to the detailed steps below. 1. When you have found a webpage with a picture you would like to schedule, simply click the button you installed to schedule a post. 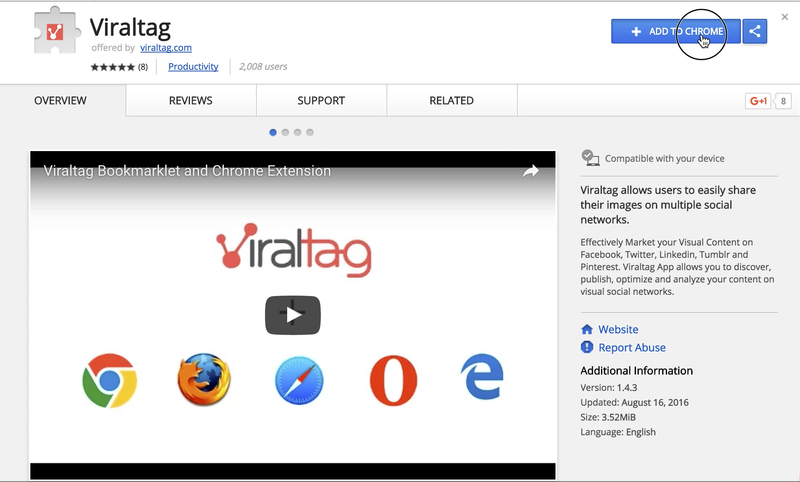 If you have installed the Chrome Button, simply click on the Viraltag icon in the toolbar. If you installed the "bookmarklet" in your toolbar, click that button to schedule a post from a webpage. 2. After you click the toolbar button, a screen will appear with all the images from that page that are available to be scheduled. Click on the image you wish to schedule. You will know the image is selected when you see a red tick on the top left hand corner of the image. Click on the "Next" button on the top right hand corner of the screen. 3. You can now schedule you image as you normally would. If you would like more details on how to proceed from here, click here. 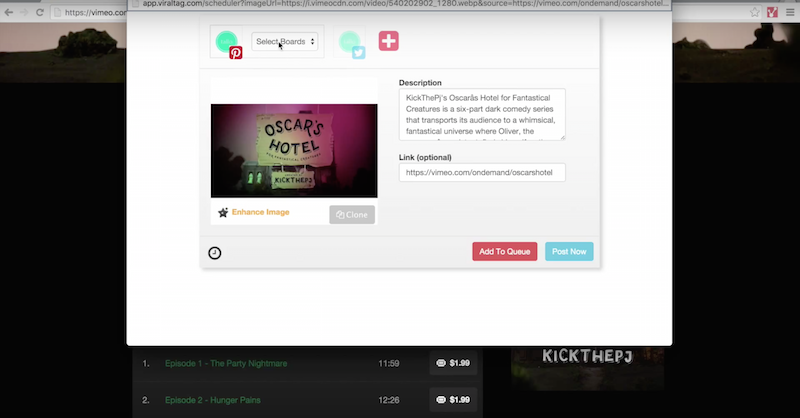 You can schedule videos from Youtube, Vimeo and Dailymotion to Pinterest using your Viraltag browser button. You can view the video demo or refer to the detailed steps below. 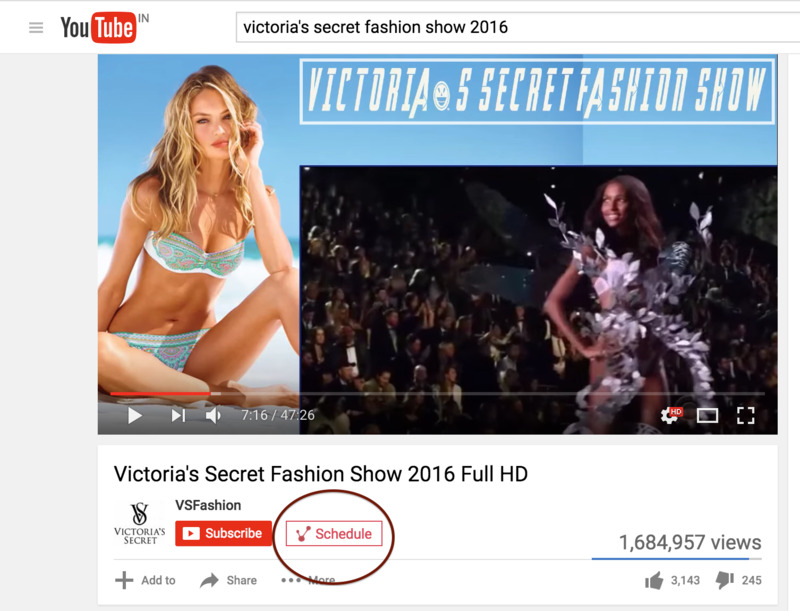 To schedule from Youtube: To schedule a Youtube video to Pinterest, click on the Viraltag browser button which is placed below the video window, right next to the subscribe button. You will see the Viraltag scheduling window. Click on the Pinterest profiles and boards that you want to schedule your video to and schedule as you normally would. To Schedule from Dailymotion: To schedule a Dailymotion video to Pinterest, click on the Viraltag browser button which is placed below the video window, right next to the Follow button. 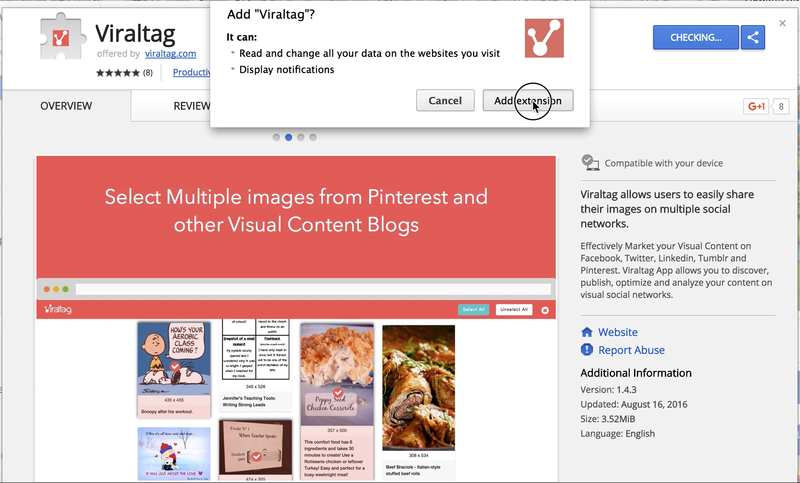 To Schedule from Vimeo: To schedule a Vimeo video to Pinterest, click on the Viraltag browser button which is placed below the video window, right next to the social sharing icons.